In a harrowing survival story emerging from Hurricane Harvey’s assault on southeast Texas, a pair of journalists documenting a seemingly routine civilian boat rescue survived near-electrocution and blunt force trauma, and clung to tree branches for 18 hours through hallucinations and relentless rainstorms before being rescued by chance late Tuesday morning. On Monday afternoon, senior reporter Alan Butterfield and photojournalist Ruaridh Connellan from the website DailyMail.com chanced upon five volunteer rescuers preparing to motor a small boat through Greens Bayou near Interstate 10 in east Houston to try to rescue an elderly wheelchair-bound resident. The reporters asked to tag along, the volunteer rescuers agreed, and the team of seven headed out around 3 p.m. 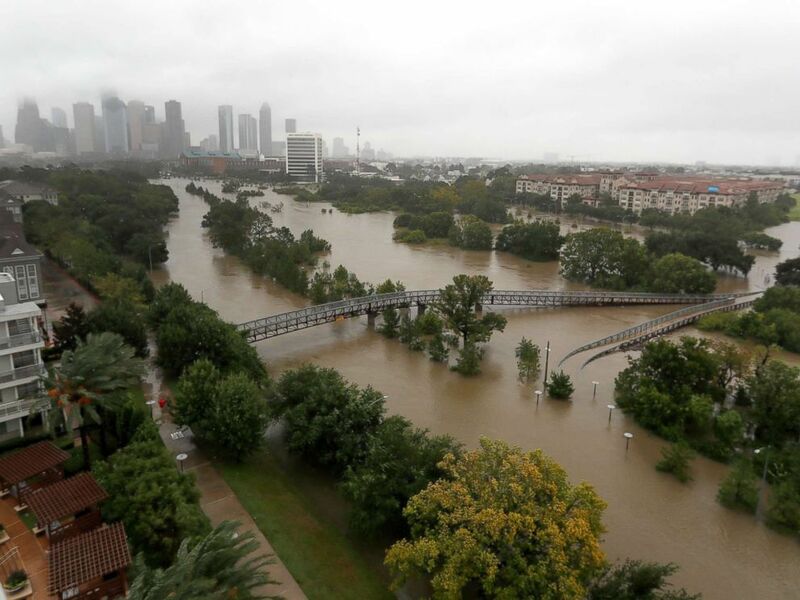 Within minutes, the powerful currents were dragging the tiny vessel toward downed power lines 20 feet away in a swampy offshoot of Houston’s overflowing Buffalo Bayou. The reporters and several civilian rescuers leapt from the boat into the water as it barreled toward downed power lines and exploded. "I felt the shock go through my body and I heard the noise and then it was just like a battle for your life," Butterfield told ABC News from Houston’s Memorial Hermann Greater Heights Hospital Thursday, perched in a chair beside his bed-ridden colleague. "The boat hit the powerlines, shocked everyone, rebounded back toward me and [then] I remember seeing the black smoke billowing out of the boat." The last thing Butterfield remembers seeing before he was swept into the powerful currents was the body of one of the civilian rescuers -- the only one on the boat with a life vest. "He was floating and he looked unconscious and there were bubbles coming out of his mouth and ... I looked up again and the guy was gone. The current had swept him away." A rescue boat evacuates people from the rising waters of Buffalo Bayou following Hurricane Harvey in a neighborhood west of Houston, Texas, August 30, 2017. The two reporters said they had just gotten settled into the bow of the boat and were in high spirits, joking around with each other and anxious to capture some compelling video of a rescue when the accident occurred. "I looked up [and] I saw the transformers blowing," Butterfield said. "You see these blue, electric shocks coming off the wires, and I remember seeing it and [thinking], ‘Holy! We’re going to go into that! We were probably 10 to 20 feet away ... and I looked up and I heard some arcing and then, within seconds, I jumped. "Probably within five seconds later, I heard the boat hit the wires and you just heard all sorts of electric shocking noises, you know, like a bug zapper that’s the best way to describe [it] -- amplified 10 million times." Two of the volunteer rescuers were killed, according to Harris County officials. Two remain missing and one survived and remains hospitalized, Butterfield said. "We’re lucky," Butterfield said. "We’ve suffered massive injuries and possibly psychologically devastating effects, but at least we're alive. There are other people. Two people, I think, they’ve recovered two bodies. And let's hope the other two are still alive maybe in another tree, let's hope. But, you know, we’re lucky. There’s at least two deaths on this, so we’re grateful." Butterfield, Connellan and a third man who survived, Jose Vizueth, 30, managed to cling to a dinghy that the boat had been towing behind it to carry the wheelchair-bound senior to safety. Butterfield said he never saw the other men again. "We sort of twisted the dinghy and guided it, sort of like a rudder [and] crashed into some trees" about a quarter mile down the bayou, Butterfield said. Butterfield and Vizueth managed to climb into a tree, but Connellan’s arms were too weak from fighting the currents, and so for hours he clung to a submerged tree branch several feet from the tree where the other two men were perched. "There were a few times during the night where [Connellan] kept on saying, "Alan, the branch is breaking. What do I do?" Butterfield recalled. "And I said, “If it breaks you’ve got to grab on to the next one you see. "By that time he was like 50, 75 yards away, instead of 15 or 20 feet, but he was in a much better area for himself." Soon there was nothing to do but wait. The rain was pouring down in sheets, darkness was moving in, and the men took turns calling out for help. "For the first couple hours I thought, 'We're going to be rescued soon, because we were so close we heard the cars on the freeway [and] there was a neighborhood, as the crow flies, about a hundred yards away from us.' But it had been abandoned. It might as well have been five miles away from us." 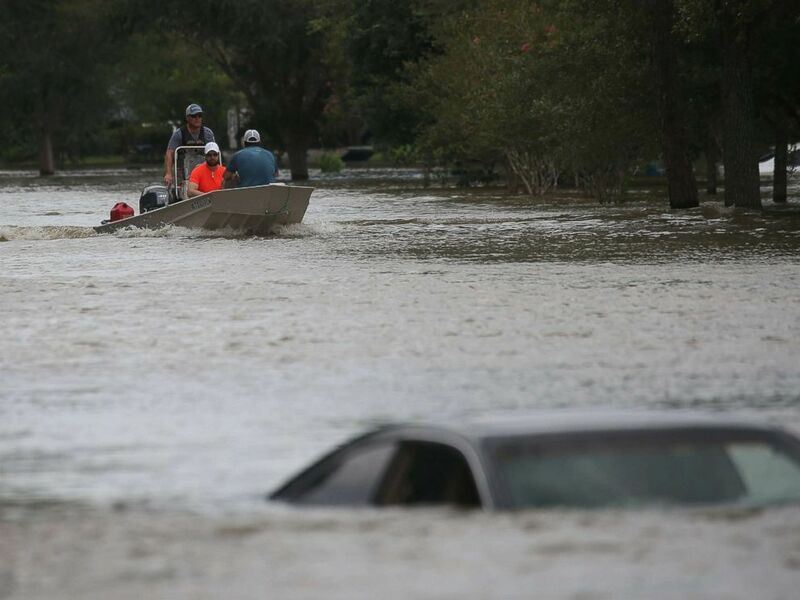 Since rescue efforts began, Texas public safety officials haven't been able to give up space in their rescue vehicles to reporters, so for many journalists, getting to the front lines of the rescue efforts required finding the right place to be at the right time. Before the afternoon rescue mission, Butterfield and Connellan had given little thought to alerting editors or local officials about their locations for safety’s sake. No one else knew where they were. "I had some real hope that we were going to be rescued, but sadly no," Butterfield said. "And then darkness fell." Connellan said exhaustion and fear wore him down through the night. "I came to terms with the fact that I was going to die and that there was nothing I could do about it," Connellan said. "I kept saying to Alan, 'I’m going to die and you’ve got to tell my girlfriend and, you know, my parents that I love them.' And he was saying, 'No! Don’t! You can tell them yourself.' But I was pretty certain that that was it. That that was the end." Up in the tree, Butterfield was growing dizzy from thirst. "I’d tip my head back and let my eyelids get full of rainwater and then let it dribble down on through my nose and through [to] my mouth and get a teaspoon at a time," Butterfield said. "And it was like that’s the only thing I fantasized about, 'I hope I get rescued and the sheriff’s department has a bottle of Gatorade for me.' Those were my only thoughts. I never really thought of dying. There’s no way. Daylight brought little relief, only relentless rain and wind. Connellan said that by morning he was hallucinating. "Honestly, from the lack of sleep -- and I lost my glasses that night -- I was hallucinating so I thought that the replies I was getting [were real] and I kept seeing boats coming for us but it just wasn’t happening," Connellan said. "But finally, I can really hear it and I can see this boat and it’s just pure relief. I mean I just felt like I’d given up complete hope and they turned up." The trio said they were rescued by a Texas Department of Public Safety patrol boat. The DPS did not immediately respond to a request for comment. Neither man has had an opportunity yet to reconnect with either Vizueth or their rescuers. "Hurricane bros!" Connellan said, managing a smile. "Yes, hurricane bros," Butterfield replied with a weak smile of his own. "It’s amazing what the spirit and mind can do when you have to," Butterfield continued, as tears filled his eyes. Seeing this, Connellan picked up the conversation. "He kept saying, 'dig deep, dig deep,'" Connellan said. "And it worked."